1. A Toyota Prius icon appears on the bottom right of the screen. On click, the ad takes over the page. 2. 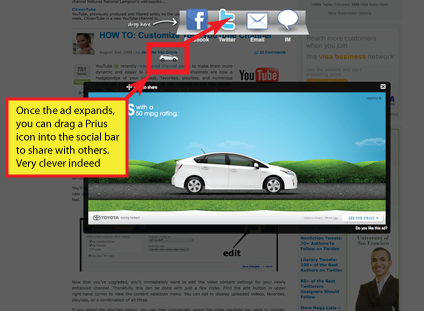 The Prius icon reappears on the ad and the user is prompted to drag it into a social media bar with Facebook, Twitter, Email and IM options. 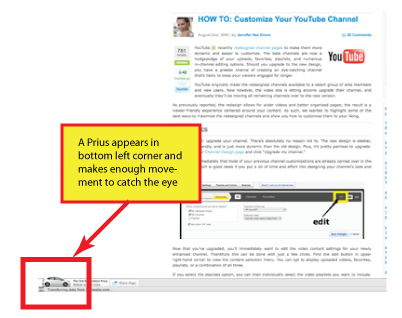 This social media sharing approach for display ads will become as common as social sharing features found on web pages. Marketers who embrace this approach to integrating display ads and social media will undoubtedly increase both the efficiency and effectiveness of their online campaigns.